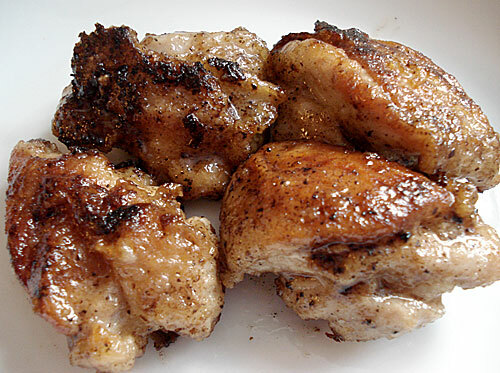 This is a variation on the Balsamic Vinegar and Sesame Chicken recipe. I came up with this when I ran out of balsamic vinegar and had to make do with plain red wine vinegar - which of course is much cheaper. It’s even simpler to make since you do not have to deal with the sesame. I’ve even left the skin on this time for extra flavor, but you can remove it if you prefer too. A savoury recipe! I'm sure that it would be great with shrimps instead of chicken also. This sounds yummy and easy! I know what you mean about Hungry guys and gals! I've got 5 here, one middle aged hubby, but with a fast metabolism, a teen boy and two teen girls. I tried the other day to make a bunch of recipes to have in the fridge for bento making. Well they all came home, raided the fridge and proceeded to devour 3 to 4 days worth of bento food in one afternoon! So much for cooking ahead! I'm going to try to figure something out. Maybe I'm too good of a cook, lol! You can keep them for a day or two; if you want to keep them longer, you can freeze them. Just made these. I made about 30 pieces. I can't say more than 25 are going to last until dinner. I love this recipe especially since im semi new to japanese cooking and bento making. And for my mom to say "That looks good! When are are you making it!" Is a huge thing since she's really not into trying new things often. But I do have one question...what would say would be some good sides to go with?